One of the best ‘feel good’ experiences you can enjoy is having freshly-cleaned carpet or furniture. And then, disaster happens in form of red wine, tomato sauce, bright red Kool-Aid or pet urine. So you franticaly apply all kinds of household cleaning products and scrub, scrub, scrub. That new spot looks a bit better but it’s still there. You don’t have time to keep dealing with it, so you move on. When you look at it a few hours later, the spot has grown and its not budging! You could have avoided this if you had asked for fabric protection when you had your carpet or furniture cleaned. Yes, fabric protection does cost a bit more but it is worth it! It acts act as a kind of invisible shield that repels most substances that are spilled on the fabric. 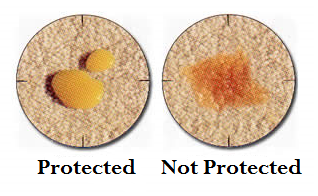 Fabric protection is similar to waxing a car; you provide protection to your paint job by applying an invisible shield. Carpet and furniture fabrics need this same type of protection. When something gets spilled on it, your cleanup job is so much easier and the potential for permanent staining is greatly reduced. A protected carpet or piece of furniture is going to last longer because when something is clean, it performs better and increases the lifetime of the fabric. Having fabric protection does not mean that you can skip regular cleaning. Dirty carpets and upholstery will wear out prematurely. Fabric protection enhances a good cleaning. It’s an added step that you want for your carpet and furniture in your home. Get peace of mind and ask for fabric protection when you have us clean your carpets and upholstery. You won’t be sorry. Also, ask us about our Spot and Spill Warranty!